This unaccustomed spell of hot weather has my basil plants growing like they’re in Italy. And with Adam and Nova both away, I had another good reason to make Lyra’s all-time favourite supper of pesto pasta. 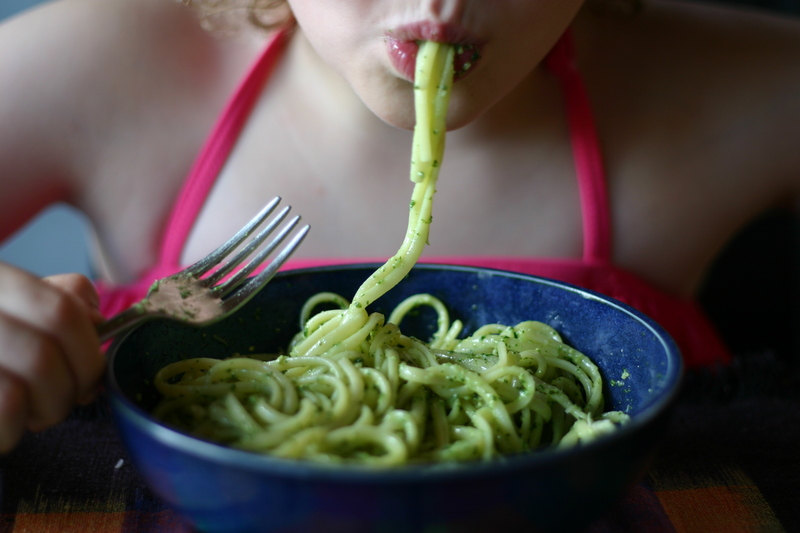 Fresh pesto is so much nicer than the stuff in jars, and takes only a few minutes to make. I don’t bother measuring the ingredients. If I don’t have pinenuts, I’ll use almonds or hazelnuts, and am equally happy with pecorino or parmesan cheese. The quantities below should make enough pesto for a pasta dinner for four. If you have pesto left over, store it in the fridge with a thin layer of olive oil poured over the surface to keep it from oxidising. Fill a large pot with water, add 1/2 a Tb of salt and bring to a rolling boil. Add the pasta and stir to prevent it from sticking. 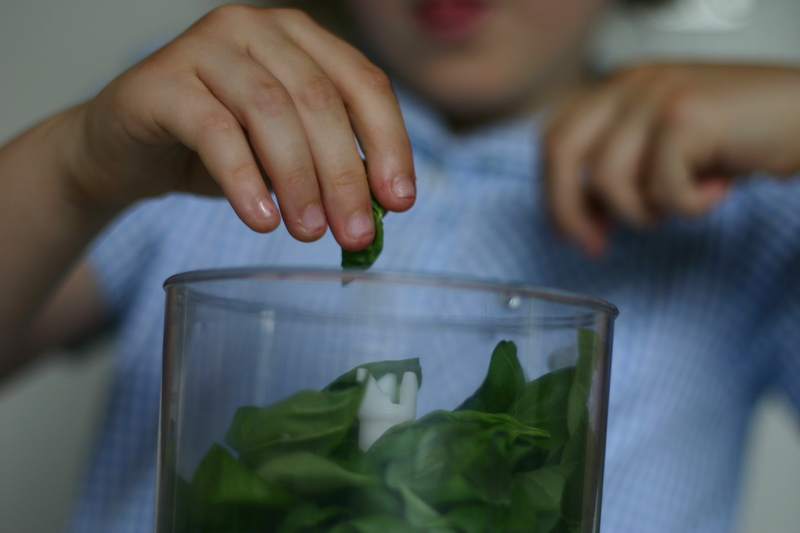 In the meantime, strip the basil leaves from their stalks. Place in a mini-chopper with the garlic and 1/2 tsp of salt. Pulse it all together, then add olive oil until the sauce reaches the right consistency (loose but not runny). Stir in the cheese by hand, then adjust the balance of flavours to your liking. When the pasta is ready, drain it into a colander and return to the pot. Add a few good dollops of pesto and stir well, until the pasta is evenly coated. Top with additional grated cheese and serve.